Resolving problems of IDPs is our main priority, president of Azerbaijan Ilham Aliyev stated at the meeting with IDP families following the opening ceremony of a new residential complex in the territory of Kurdakhani settlement. 'Last year 5 thousand apartments were built for IDPs. We continue to work on this direction. It is planned to build 6 thousand apartments until the end of year,' the head of state added. The highest standards of living have been created here. Once again it shows that Azerbaijani citizen is in the center of our policy, president of Azerbaijan Ilham Aliyev stated at the meeting with IDP families following the opening ceremony of a new residential complex in the territory of Kurdakhani settlement. 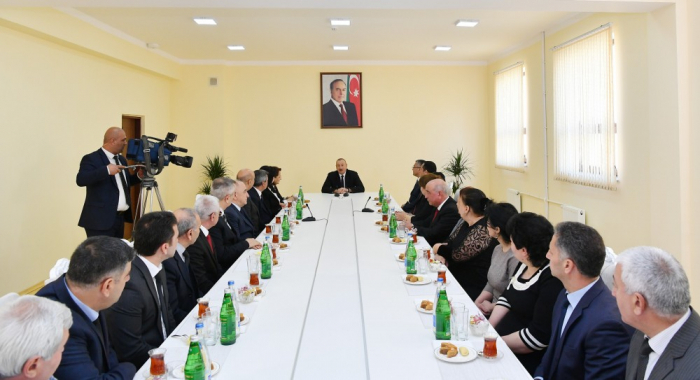 The president of Azerbaijan Ilham Aliyev met IDP families following the opening ceremony of a new residential complex for IDP families in Sabunchu district of Baku, AzVision.az reports. The head of state then familiarized themselves with the conditions created at the complex.